California pine trees grow from the mountains to the sea. They soar to the sky and keep close to the ground. California pine trees are a significant part of the ecosystem and a distinctive part of the landscape. 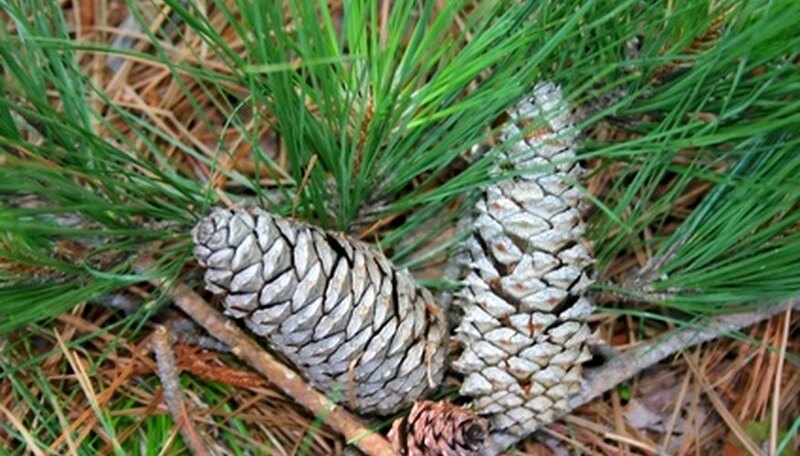 Pine trees are evergreen with long slender leaves that most people call needles. Pine trees belong to the genus "Pinus." The Bishop pine (Pinus muricata) is a single-stem tree that grows on average to 90 feet high. It has green foliage and produces orange flowers. It grows rapidly and most actively in spring and summer. It produces needles in bundles of two. The California foothill pine (Pinus sabiniana) reaches 80 feet in height at maturity. It bears yellow flowers in the spring. It is a slow grower. It has three needles that grow to lengths of 8 to 12 inches. The needles are gray-green in color. Its cones are 6 to 14 inches. Coulter pine (Pinus coulteri) produces very large cones that grow between 8 to 12 inches long and 6 inches in diameter. The needles grow in bundles of three. The Colulter pine is a slow-growing tree. It exhibits its most active growth period in spring and summer. Yellow flowers bloom in late spring. Jeffrey pine (Pinus jeffrey) grows to a mature height of 80 to 150 feet. These pines tend to give off a vanilla or pineapple scent. The leaves grow in bundles of three needles. The needles are a gray-green color. The trees grow predominantly at an altitude of 5,000 to 7,000 feet above sea level. The Monterey pine (Pinus radiata) produces leaves in bundles of three needles in lengths of 4 to 6 inches. In most instances, it grows 40 to 60 feet tall. However, some specimens grow to more than 100 feet high. Its native habitat is within 7 miles of California's Pacific coast. Ponderosa pine (Pinus ponderosa) reaches 165 feet high at maturity. The leaves grow in bundles of three needles. The needles grow to 7 inches in length. The bark is gray to black early in its life and later turns a yellow and black color with deep furrows. The leaves of Singleleaf pinon (Pinus monophylla) are single needles. The needles grow to less than 2 inches at maturity. The tree grows to 40 feet high. Their natural habitat is between 3,000 to 9,500 feet above sea level. The bark changes from smooth and gray to furrowed and reddish brown. Sugar Pine (Pinus lambertiana) is the tallest of American pines. It grows 200 feet high. The needles appear in bundles of five. In many instances, the needles are twisted, with thin white lines. Torrey pine (Pinus torreyana) is a rare tree in terms of its occurrence; it now grows naturally only in a few places in Southern California and rare in that It is the only hard pine that develops five needles per bundle. The needles are long, averaging more than 7 inches. It produces edible pine nuts. The Torrey pine grows slowly. Western white pine (Pinus monticola) needles grow in bundles of five. Its cones are 8 to 15 inches long. The tree grows rapidly and reaches a height of 200 feet tall. The bark of an immature tree is grayish green and develops to a gray to purplish-gray bark as it ages.